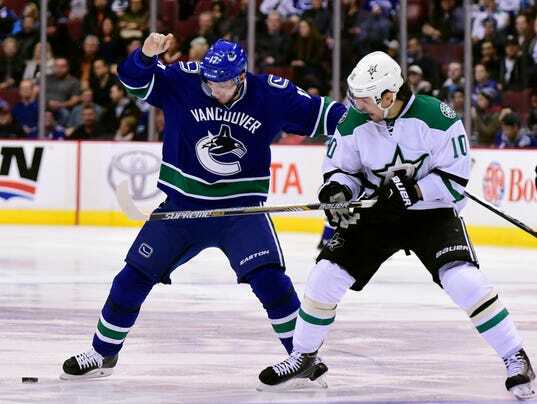 VANCOUVER, British Columbia (AP) — Patrick Sharp scored the tiebreaking goal with 5:59 left in the third period and the Dallas Stars beat the Vancouver Canucks 4-2 on Thursday night. Sharp took a stretch pass from Dallas defenseman Alex Goligoski and wove into the Vancouver zone before beating Canucks goalie Ryan Miller with a quick shot through the pads for his ninth of the season. Vancouver head coach Willie Desjardins used his challenge to see if the play was offside, but the call stood after review. Valeri Nichushkin had a goal and an assist, and Tyler Seguin also scored for the Stars, who became the NHL’s first team to 20 wins this season while also matching Montreal atop the overall standings with 41 points. Jason Spezza added another goal into an empty net, while Goligoski picked up two assists. Kari Lehtonen stopped 14 shots to get the Stars’ 10th straight victory over Vancouver and fifth straight at Rogers Arena.